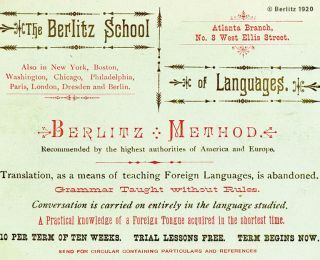 The Berlitz Method® is a natural way to learn a new language. When it was introduced in 1878, this intuitive, conversational style of teaching revolutionized language instruction. Today, our proven, effective Berlitz communicative method remains at the core of our company’s teaching approach. Our method was designed to allow learners to speak without translation - the objective being that students will be able to work out grammatical rules from the input language provided, without necessarily being able to explain the rules overtly. Learners take on the new language the same way they did their first - with natural ease.